Do you want to get “goosepimples” along with your sample library? If so you’ll want to check out the newest multi-format sample library from Plugin Guru John “Skippy” Lehmkuhl called Megamagic Pads. This sample library is stuffed with patches presets and samples for just about any rig you are using. Megamagic Pads is one purchase that includes 141 patches and 63 Multis for Omnisphere 2.1 with over 1 GB of samples – 163 patches for Kontakt 5.51 – over 100 patches for Serum and Iris – 109 patches for EXS24 and a Reason Refill version. • Sounds are created 100% “in the box”. There are a bazillion different libraries where people sample all their old analog/digital synthesizers. That’s nice. It’s been done. So for this library I used: ElectraX, Codex, Nave, Sculpture, Loom, Blue, Wavestation, ES2, Spire, Nemesis, the original Alchemy as my sound pallete. • I then would mix 1,2 or sometimes 3 sounds together to make the final sound which would then be fed into similar Magical REVERB effects like you hear in MegaMagic Dreams. That’s the MegaMagic part of these libraries. You don’t need ANYTHING else to have the lush sounds, the ambience is recorded into the sound. This creates sounds like you have truly never played before…. • The samples are up to 20+ seconds long and there are 6 samples to make a single final sound. This is important. For over 25 years I’ve worked as one of the principal sound designers for Korg. A lot of the Synth PCM in their workstations was created by me. A lot of the Synth pad Patches were created by me. When working with these workstations, I was generally limited to less than 2 seconds for each sample due to memory limitations (these are less critcal now that memory is abundant). So for this library I want the sounds to truly be ALIVE. They go on forever and then they were carefully cross-fade looped so you can’t even tell where the loop is at. This way, the sounds are interacting with each other in magical ways that keep the sound alive – you never hear a loop appear no matter how long you hold down a note. The crossfade technique I use records this into the final samples so that these sounds play the same no matter where you load them (as long as where you load them can read loop points correctly). 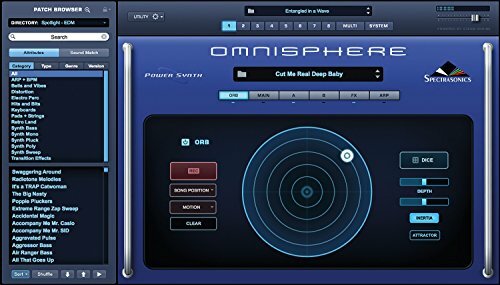 •This is THE FIRST commercially available library for Omnisphere 2.1 that uses MULTI MODE to Play a 6-Sample Sound! This looks like a killer sample libray! I can’t wait to get my hands on it! Check out Megamagic Dreams at the Pluginguru site. « What the hell is a Cinematic Fiddle?